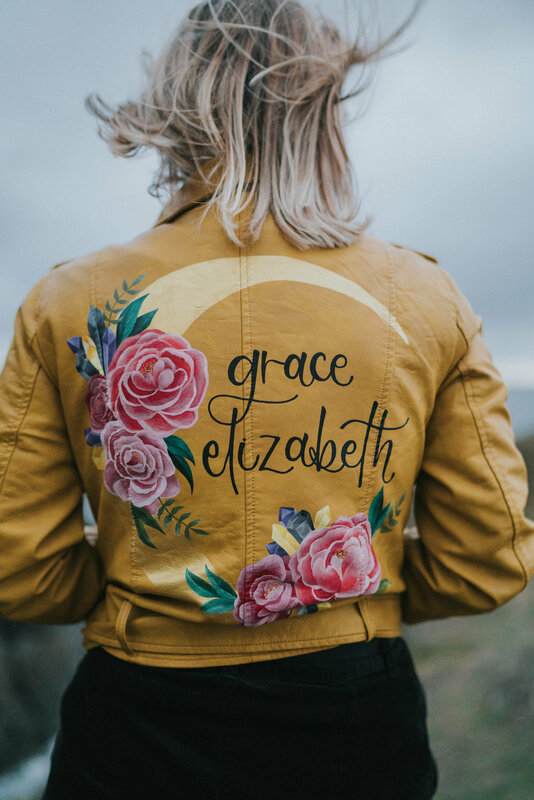 I first reached out to Stacey a little while ago now via Instagram, and we became friends pretty quickly, which was probably a bad thing in the long run because I absolutely fell in love with her jackets and the beautiful painting she adorned them with. She is so very skilled! I sent it off to Stacey and I can’t even begin to explain how excited I was! I had told her that I really wanted to incorporate a moon (tying in with a tattoo I have), crystals (as I really love crystals and my grandma is a crystal healer) and peonies (because who doesn’t love peonies?!) along with my business name, Grace Elizabeth, and within a few days, she had sketched up some ideas. I gave her the go-ahead and completely trusted her from the start. She was absolutely great, and kept me up to date every few days or so, messaging me with photos, which I loved seeing! She is a true artist! I really hope you love seeing her hard work, it looks beyond incredible in real life, thank you SO much Stacey!